The townland in which this park is situated is known as Terryland or Tirellan, derived from the Irish Tír Oileáin (the Land of the Islands ) which was so named because the river divided into many streams, thus creating islands in the area. It is in the civil parish of St Nicholas in the Barony of Galway. Historically, the area was famous for Terryland Castle, popularly known as Oldcastle, a strategically important building as it commanded the river at a point where there was a ford. The De Burgh family built the castle in the late 14th or early 15th century to protect the river crossing from the O’Flahertys. It later devolved to the Lynch family. It was occupied by Sir Charles Coote during the Cromwellian campaign. In 1691, there were French musketeers in residence when it was being attacked by General Ginkel. They abandoned it and set fire to it leaving it in ruins ever since. The other main construction in the area was the city waterworks which was designed by Samuel Roberts and completed in 1867. It took two iron water-wheels to actuate its pumping machinery. In 1895 a steam engine was added as an auxiliary, and in 1906 the water wheels were replaced by water turbines. Most of the land in the area was farmland. A local farmer, Dean Flynn, sold one of his fields to the Galway Football Association for £250, and the first soccer game played there was on February 3, 1935, between Galway Macks and Athlone Town. The FA then started to build a wall around the park and this was finished in January 1940. 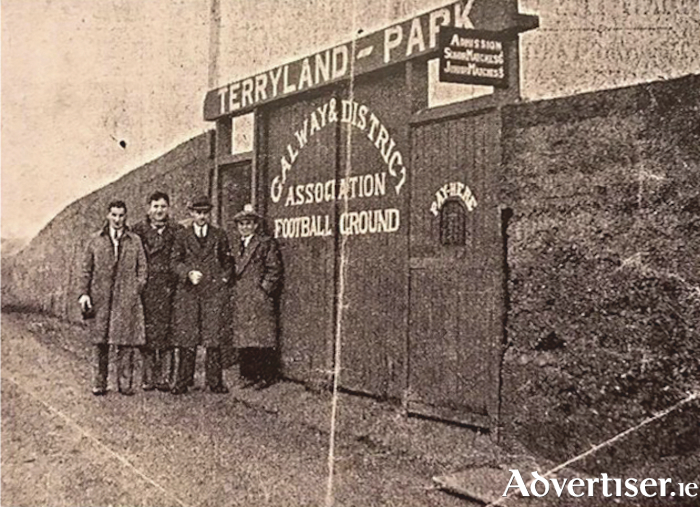 Our photograph was taken at that time and shows the entrance to the newly named Terryland Park, Galway and District Association Football Ground. Admission was sixpence to senior matches and three pence to junior games. You paid at the slot in the wall in the foreground and went in through the door where the gentlemen are standing. There was a bit of a slope on the pitch and a small shed for togging out. Since then, the facility has been in constant use, hosting about 90 games per season. Galway Rovers were founded in the Claddagh in 1937 and 40 years later they became the first Galway club to play in the League of Ireland. This was their home ground. They drew their first game against St Patrick’s Athletic. In 1981, they changed their name to Galway United. Two years later, there was a major redevelopment job done on the park, and significant changes since have brought the seating capacity up to 5,000 and floodlights have been installed. In 2012, the name of the stadium was changed to Eamonn Deacy Park in honour of ‘Chick’ who was arguably Galway’s greatest ever soccer player. Coincidentally Dean Flynn, who owned the land originally, was his grandfather. Tomorrow evening, Galway United play their first game of the season in the first division of the league of Ireland when they host Athlone Town. Let us hope they get lots of support to help them in their quest to quickly get back to the Premier Division.